Postnatal depletion can affect mothers up to ten years after giving birth, Lucy Kippist explains why. Loss of libido, fatigue, hyper-vigilance, overwhelmed with too many decisions, loss of confidence, confusion, poor concentration and memory, run down and anxious. Far from the picture book depiction of motherhood, this is the reality of postnatal depletion, a veritable onslaught on a woman’s physical and mental health, that can strike up to ten years after giving birth. That’s according to a new book by Dr Oscar Serrallach called The Postnatal Depletion Cure: A Complete Guide to Rebuilding Your Health. Dr Serrallach told Kinderling Conversation that the speed of modern life and the demand on mothers to ‘bounce back’ after birth is contributing significantly to the problem. Why does postnatal depletion occur? “The average age of a first-time mother now is 30.9 years, which means most women are in a pre-depleted state right from the start,” says Oscar. “Women are expected to turn up to life pretty quickly after having a baby,” says Oscar. And that’s a demand our body meets with a fascinating increase in neurons within our hypothalamus, the part of our brain that makes us motivated to do more – for others. Oscar says sleep is the place where women can recover a lot of hormones. “New mothers need to try and get as many 90-minute chunks at night as they can, and then as many 15-minute naps as you can, every day. And go to bed as early as you can. Sleep is non-negotiable”. According to Oscar, dads/partners have the biggest role to play here. “Women often feel they have to do everything themselves, and the father/partner has a big responsibility here. “Fathers need to know that their role in the relationship and family has changed dramatically. Dads can’t expect the previous life they had with their partner to continue. They need to recognise they’re going into a stage of mature love with their partner. Having fallen into a pit of exhaustion after the birth of my first child, I wanted to prepare myself for a better performance the second time around. One of my lingering memories was the combination of insatiable hunger and not having enough time or energy to eat properly. I knew once my second child arrived, this would be even harder if I didn’t make a plan. A long-time fan of nutritionist Heidi Sze’s beautiful blog, Apples Under my Bed, I signed up for a session with her on postpartum nutrition. We had two Skype calls while I breastfed my baby and several emails back and forth where I shared what I was eating and what I wanted to achieve. I also signed up for a monthly newsletter that comes with great recipe suggestions. Heidi’s core message was the importance of preparing nutrient-dense meals ahead of time that I could stock in the freezer; and to remember that on the days where I hadn’t slept well at all, to aim to double the nutrient-density of my food. So, rather than four slices of toast with butter and super big coffee, to make scrambled eggs with a side of veggies or a big bowl of porridge with lots of seeds and nuts. Her simple suggestions and tweaks to nutritious meals (like avocado and eggs on toast for breakfast, a batch of pumpkin and lentil soup, and home-made cakes and protein balls for snacks) helped me keep my energy levels up, even through a whole year of maternity leave. Simply put, don’t underestimate the value of sharing your journey with someone else going through motherhood. Even a 15-minute chat over a half-drunk cup of coffee while your babies scream in their prams gives you a wonderful sense of true connection and being understood. 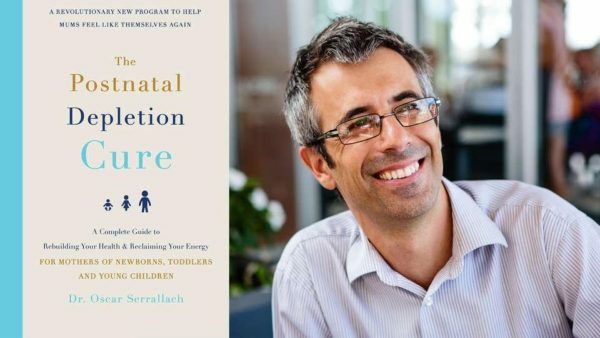 Dr Oscar Serrallach’s book, The Postnatal Depletion Cure: A Complete Guide to Rebuilding Your Health is available on Booktopia or wherever you buy your books. If you or someone you know are suffering from depression and/or anxiety – during pregnancy or after having a baby – PANDA are at the ready to provide support and advice. PANDA National Helpline – Mon to Fri, 9am – 7.30pm AEST – 1300 726 306.